PMC launches Twenty5 speaker series with Laminair vent design | What Hi-Fi? More new speakers from High End 2016 in Munich, this time in the form of the PMC Twenty5 series. Released to coincide with PMC's 25th anniversary (hence the name), there are two standmount speakers and three floorstanding models in the range, plus provision for a 5.1 surround package. PMC is confident the new models more than justify the extra outlay compared to the Twenty series, a range which has received a straight sweep of five-star reviews. Key to the Twenty5 speakers is the new Laminair vent technology, which takes aerodynamic lessons from Formula 1 cars - thanks in no small part to PMC's head of design, Oliver Thomas, having a background in F1. The Laminair vents are designed to create a smoother passage of air through the speaker and out of the vents at the bottom of each cabinet. PMC claims this seriously improves bass definition, timing and dynamics. Pretty much everything else has been upgraded from the Twenty series, too, from the mid/bass drivers to the motor system, the crossovers to the fine-tuning of the tweeters. The dimensions of the new speakers have been slightly adjusted compared to their predecessors, while the cabinets are thicker and stiffer. This all helps to reduce resonances, as do the new plinths with extra isolation. 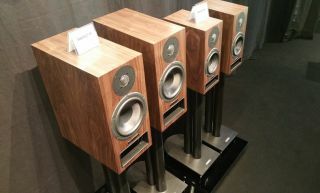 The Twenty5 range comprises the two-way Twenty5 21 and Twenty5 22 bookshelf speakers, and three floorstanding models, the Twenty5 23, Twenty5 24 (both two-way) and the three-way Twenty5 26. For those looking to put together a 5.1 surround sound package, there's also a two-way Twenty5 C centre channel and Twenty5 SUB subwoofer. All the models have the same 27mm tweeter. The 21 and 23 have a 13cm mid/bass driver, the 22 and 24 use a 16.5cm mid/bass driver, and the flagship 26 has a 18cm driver. There's a choice of oak, walnut and amarone real-wood veneer finishes, plus high-gloss diamond black. The full Twenty5 range should be on sale in June, and UK prices are as follows: Twenty5 21 £1870; Twenty5 22 £2450; Twenty5 23 £2970; Twenty5 24 £4250; Twenty5 26 £6995; Twenty5 C £1650; Twenty5 SUB £3450; and the Twenty5 stand £295. Will the Twenty5 25 be a special edition? Or did the name just prove too confusing? We look forward to getting them in for review.